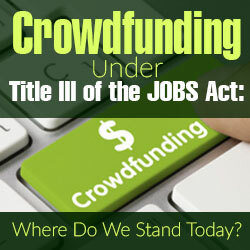 You are here: Home / Crowdfunding News / Crowdfunding Under Title III of the JOBS Act: Where Do We Stand Today? When a bi-partisan Congress passed the JOBS Act in 2012 (H.R. 3606), small businesses and start-ups thought that the fundraising world was about to change. Among other innovations, in one of the biggest changes to securities law since 1933, the JOBS Act intended to make it possible for small businesses and start-ups to solicit investors directly – in person and on the Web – to make investments in their companies. Congress expected change to occur immediately. Congressman Patrick McHenry (R-NC), one of the JOBS Act’s sponsors, said that crowdfunding “utilized online technology to increase small business access to new sources of financing. . . . Social networks were not just for keeping up with friends — they could become marketplaces for everyday investors and entrepreneurs.” In 2012, when unemployment remained stubbornly high, crowdfunding became a solution that demanded swift implementation. President Obama expected immediate change. He said it was a “game changer” and that the measure “represents exactly the kind of bipartisan action we should be taking in Washington to help our economy. The intent of immediate change was also clearly spelled out in the JOBS Act itself. In the Act Congress specifically directed the SEC to adopt implementing regulations for the crowdfunding provisions of the Act with 180 days. Despite these clear instructions, the SEC stalled for more than two years. After members of Congress pushed for an explanation, SEC appointees confessed that they disagreed with the law’s aims and declined to follow the law because they thought it would harm their “legacy.” (WSJ; Wired). After Mary Jo White was nominated as SEC Chair, however, the SEC finally published proposed regulations on October 23, 2013 (the “Proposed Rules”). The Proposed Rules have been the subject of extensive comments, with the SEC reporting more than one hundred comment letters received. Despite this activity and the nearly two years that have passed since the Proposed Rules were adopted, the SEC has not yet made the Proposed Rules official, or indicated when it might. Within the past two months there have been statements by some SEC staffers to the effect that the SEC is hoping to finalize the Proposed Rules in the Fall of 2016, perhaps by October. While this would be a welcome step forward for those who hope to utilize the potential of interstate crowdfunding, even this step would still delay the first potential crowdfunding offering to mid-2016. Because Title III of the JOBS Act envisions crowdfunding taking place on licensed “Internet portals”, the first step in implementing the new rules will be to develop a procedure for licensure and to process an initial round of portal license applications. It’s anyone’s guess how long it might take to issue a license to the first portal even after the rules are adopted. 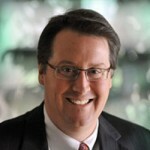 Until then, entrepreneurs have begun utilizing some of the JOBS Act’s other features that have tried to make fundraising easier, including public solicitations of private offerings under Section 506(c) of Regulation D and the recently-adopted changes to Regulation A, that allow some issuers to raise up to $50 million through a streamlined registration process.